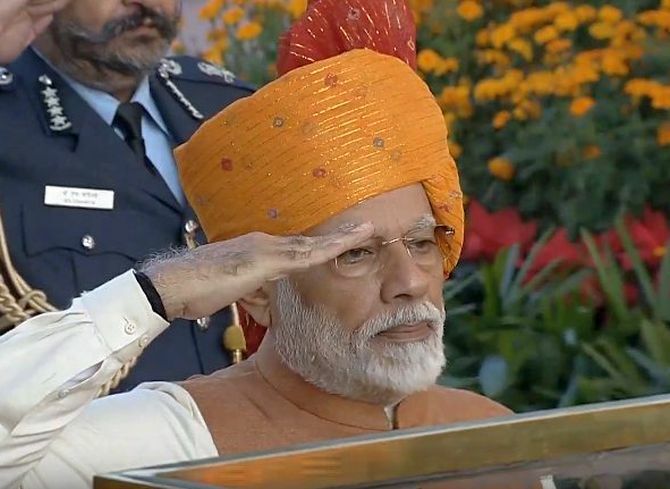 Prime Minister Narendra Damodardas Modi at the Amar Jawan Jyoti on Republic Day 2019. Milan Vaishnav, Director and Senior Fellow at the Carnegie Endowment for Peace in Washington, DC, recently won the Ramnath Goenka Award for Journalism in the non fiction category for his book When Crime Pays: Money and Muscle in Indian Politics. "A weak State allows a criminal politician to be the person who provides that guarantee to mediate whatever problem the citizen has with the State," Dr Vaishnav had told Rediff.com in an interview about the book two years ago. An alumnus of Columbia University, Dr Vaishnav's primary research focus at Carnegie is the political economy of India. He examines issues such as corruption and governance, State capacity, distributive politics and electoral behaviour. What do you see as the predominant themes in India in the months leading to the general election? I think there will be three overarching themes. The first is the economy. The BJP will not compare its record to the promises of 2013-2014, but it will try and paint a contrast with the second term of the UPA (United Progressive Alliance), which saw growth slow down, inflation tick up, and corruption scandals explode. The Congress, on the other hand, will compare the UPA's 10-year record (from 2004-2014) with the BJP's last five years in office to tout its credentials. Obviously, the Opposition is going to go hammer and tongs at the issue of 'jobless growth'. The second issue is development and welfare -- this is what the BJP would prefer to speak about. The ruling party believes that its welfare schemes are highly popular, especially among women, and that this plank will appeal to voters, particularly in rural areas. Modi's pitch to the electorate is that the BJP is responsible for establishing the pillars of the modern welfare State and that he needs another five years to fully build out this framework -- from universal banking to universal health care and direct benefit transfers. The third and final theme will be nationalism -- not Hindutva, but nationalism. We have seen this over and over again over the past five years: The government has tried to frame its economic approach, foreign policy, and social policy through this filter. It is less polarising than talking about Hindutva and, as political scientist Suhas Palshikar has noted, one can easily pivot to the idea that being a good nationalist and a good Hindu are one and the same. Obviously, the rhetoric has changed. The lofty talk of turning India into Gujarat, as he'd promised on the 2014 campaign, has slowly disappeared. The government has pivoted into more traditional areas like welfare and development. Modi still exudes confidence publicly, but I think he and the party have been rattled by the state of the economy, the Opposition's newfound collaboration, and the Congress victories in Chhattisgarh, Madhya Pradesh, and Rajasthan. This helps explain the BJP's last-ditch attempts to shore up key constituencies ahead of the election. What is your assessment of the last Budget before the General Election? What is the message emanating from it? As many commentators have already noted, this was not your standard 'interim account' -- this was a full-on election year Budget. As the 2019 race has tightened, the government is pulling out all the stops to try and shore up its support. This Budget had tax sops for the middle class, an income support scheme for farmers, and record allocations for social schemes like MGNREGS. And this comes on the heels of the government's decision to amend the Constitution to create a new 10 per cent quota for 'economically weaker sections' in the general category. Overall, I think the ruling party is feeling nervous about its reelection chances. Will no tax on income up to Rs 5 lakh help the BJP garner middle class support in cities because the party is worried about growing urban apathy? To be honest, we do not have a good evidence base to assess whether these targeted sops actually change voters's minds. For instance, we do not have one credible study (that I have seen anyway) that looks at the electoral impacts of farm loan waivers or an increase in Minimum Support Prices (MSPs). Politicians believe that they win votes and, in some sense, that is all that matters. I think the tax relief for middle class families certainly does not hurt the BJP. For a party that came to power on the promise of building and supporting a 'neo-middle class', it is important that it be seen as delivering on that pledge. The government has been constantly targeted for failing to create enough jobs and a yet to be released NSSO report stated that the unemployment rate in India at a 45-year-high -- how is unemployment going to affect the BJP's fortunes in the general election? This is going to be the BJP's Achilles's heel headed into the 2019 race. The core of the Modi promise was that he would ramp up growth, create good jobs, and revive India's moribund investment cycle. To date, growth has been uneven, formal sector jobs remain few and far between, and the investment cycle still has not been unburdened from the twin balance sheet issue (the double whammy of public sector bank Non-Performing Assets and heavily indebted corporate balance sheets). The fact that the government has not been up front about its jobs record (just witness the brouhaha over the leaked NSSO report) suggests it is insecure about its own record in this regard. Remember that the BJP did very well among young voters in 2014: states with a larger share of first-time voters (those between the ages of 18 to 22 who had never voted in a national election before) also saw the largest percentage increases in the BJP's vote share. If young voters spurn the BJP or decide to stay at home, this could spell trouble for the ruling party.